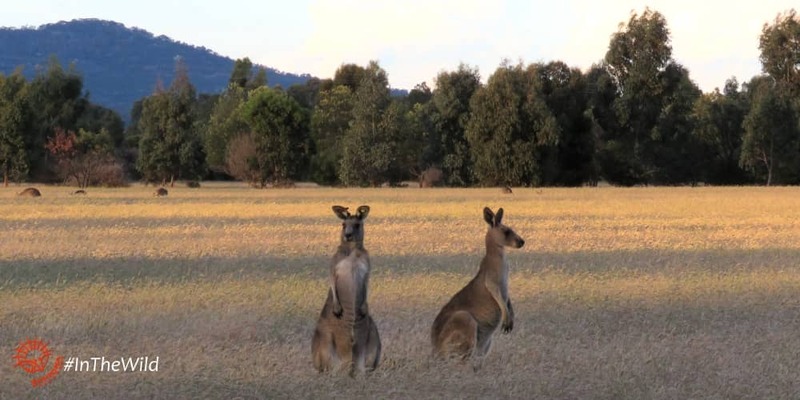 As guides on wildlife tours, we get asked for a lot of information about Eastern Grey Kangaroos. Here is a summary of the main, and most interesting, kangaroo facts. 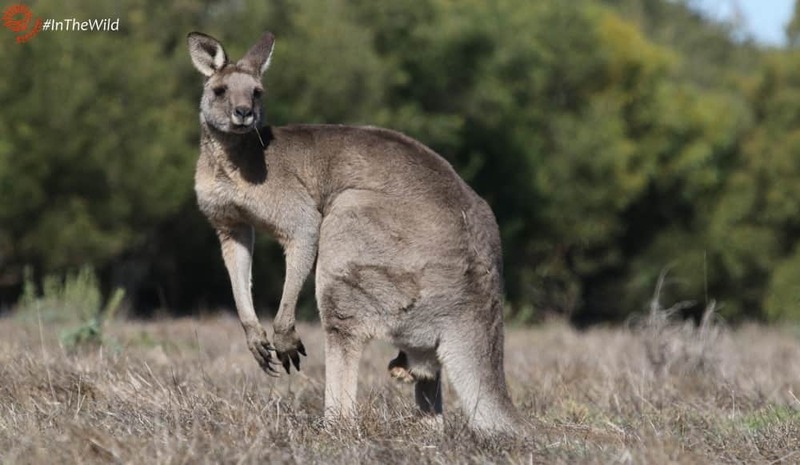 The largest kangaroo and world’s largest marsupial is the Red Kangaroo, but, as the name – Macropus giganteus – suggests the Eastern Grey Kangaroo can be almost as tall and heavy. Some of the old males we see at Serendip on our Sunset Koalas & Kangaroos tour are extremely large. Maximum recorded length of an Eastern Grey Kangaroo is 2.9m (9.5 ft – measured along the curves from nose to tail). That animal would have stood at a height of around 1.7m (5.5 ft) when standing normally (see image below), and possibly at 2m (6.5 ft) when high-standing. 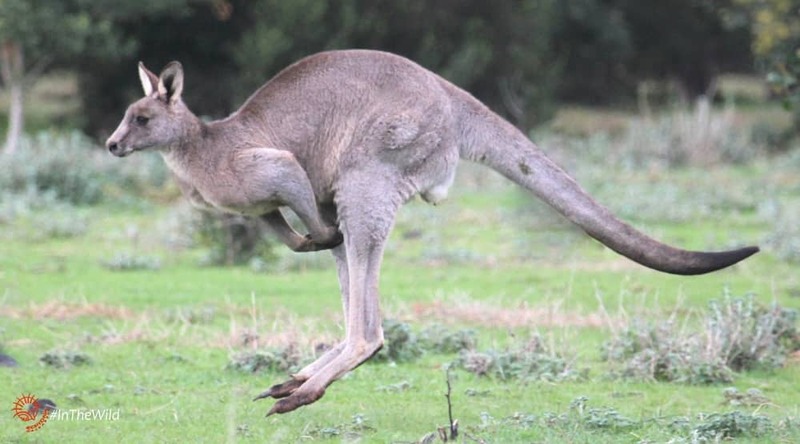 Male kangaroos stand normally on the flat of their foot. But they can also draw themselves up onto tip toes – a behaviour known as high standing. 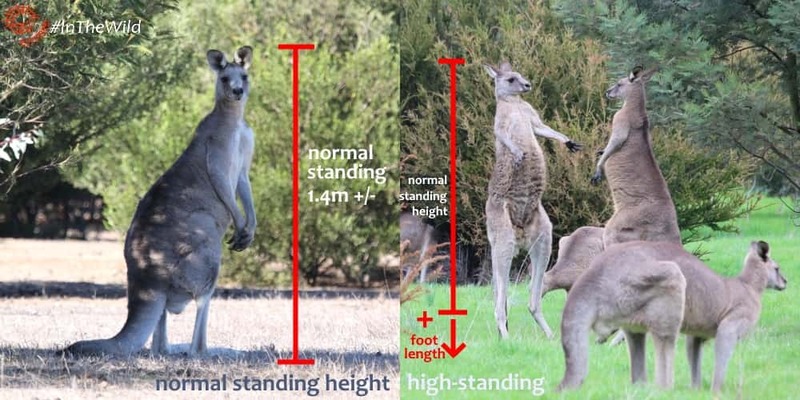 High standing could add up to 30cm (1ft) to a large male kangaroo’s height. Maximum recorded weight of a male Eastern Grey Kangaroo is 91kg (200 pounds) but most reach a max of around 66kg (145 pounds). 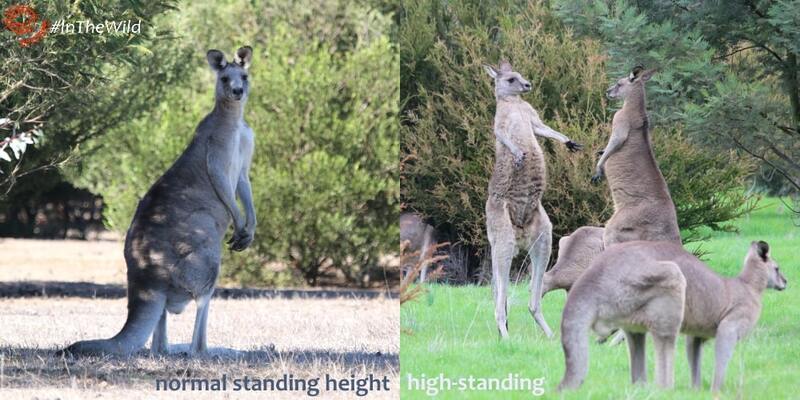 Female Eastern Grey kangaroos are much smaller in height and mass. They can weigh up to 37kg (81 pounds). See the image below, male left, female right. There is not a lot of data available on longevity. To attain great age in the wild, kangaroos need to be lucky and physically superior, live far from busy roads, and live through good seasons without too many droughts. These fortunate circumstances are becoming increasingly rare due to urbanisation and climate change. The oldest kangaroos we see near Melbourne and on our Wildlife Journey in East Gippsland are probably females, as they are more likely to stay loyal to a site and travel less than males. Average lifespan in wild: about 6 to 8 years. Kangaroo locomotion is one of the most fascinating things about them. It is fast, quiet and agile. Read the details about how kangaroos hop here. Kangaroos are the fastest marsupial, and at top speed a little faster than a racehorse. Depending on what you read, the top recorded speed for a kangaroo was a female Eastern Grey Kangaroo at 64 km/hr (40m/hr). But some publications state speeds of up to 71 km/hr (44m/hr). A single hop by a very large male kangaroo can be up to 9 metres* (29 ft) in length and 3m (10 ft) in height. Hopping is very efficient at speed, but energy-intensive at slow speeds. Gestation period for an Eastern Grey Kangaroo is 36 days. Female Eastern Grey Kangaroos can breed at any time of year, but there is a peak of births in spring. Learn about kangaroo mating here. Embryonic diapause occurs in Eastern Grey Kangaroos. 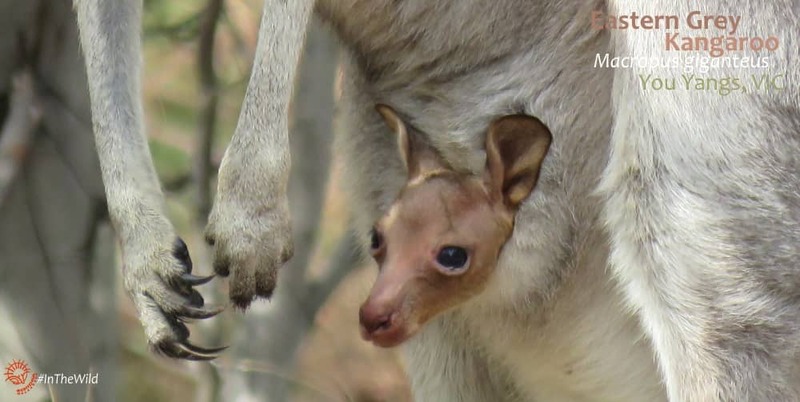 Learn how to guess the age of a kangaroo joey here. Male kangaroo fighting is often called boxing because two males stand face to face and hit each other with their hands. The most damaging action, though, is a powerful back leg kick to the opponent’s stomach or groin. Eastern Grey Kangaroos fight or box most during the peak breeding time in spring. Young males fight at a low level often, learning their skills and establishing their place in the hierachy. 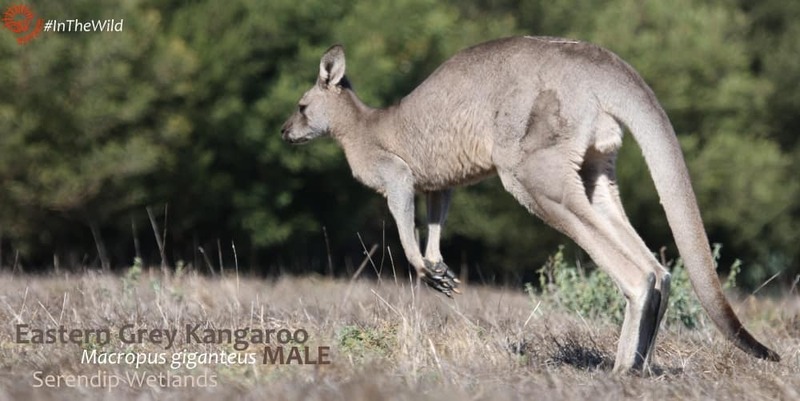 As they age, male kangaroos try to avoid fighting by displaying. Learn about it here. Large males fight rarely. Even with the very large number of kangaroos we see on the Wildlife Journey, Great Ocean Road and Sunset Koalas & Kangaroos tours, we only see a serious fight between top level male Eastern Greys once or twice a year. Kangaroo-type animals have been around for a very long time. The earliest kangaroo fossils are 25 million years old. Some extinct kangaroos were very large: Procoptodon goliah was 2.2m tall and weighed 200 kg. Interested in other types of kangaroos and wallabies? 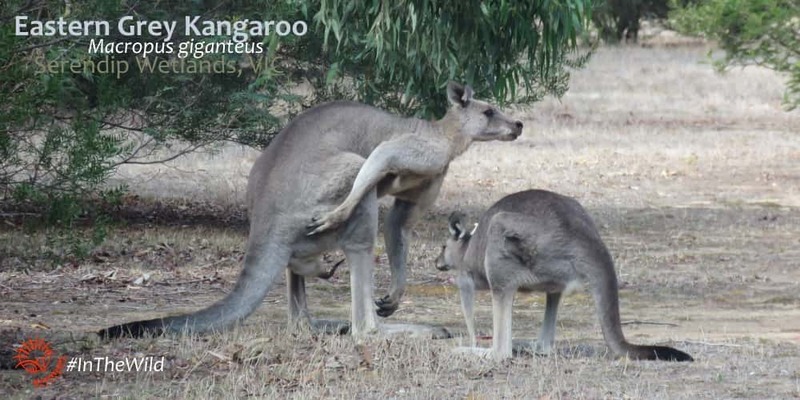 There are 51 species of living macropods in Australia – read about them here. Please support our wild kangaroos by booking a wildlife tour with us. Part of every tour cost goes to research and advocacy for these special Australian animals. * I have personally seen the footprints of a single hop by a large male spaced apart 9 metres. Literature also supports this hop length.